President Macron has called for the re-invention of Europe. “Faced with the great challenges of our times, such as defence and security, great migrations, development, climate change, the digital revolution and regulation of a globalized economy”, he asked, “have European countries found means to defend their interests and values, and to guarantee and adapt their democratic and social model that is unique worldwide? Can they address each of these challenges alone? We cannot afford to keep the same policies, the same habits, the same procedures and the same budget. No more can we choose to turn inwards within national borders. The only way to ensure our future, is the rebuilding of a sovereign, united and democratic Europe”. 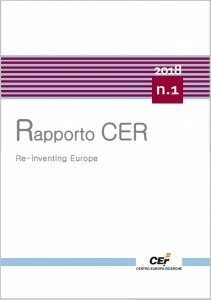 This year’s Rapporto Europa will focus on the economic context for re-inventing European model. We give particular attention to the details of a European Fiscal Union. The Maastricht Treaty did not incorporate any form of Fiscal Union, except in the very narrow sense of fiscal discipline: each member state committed to maintain sound finances and the Stability and Growth Pact (SGP) detailed the operationalisation of fiscal discipline. A common European budget exists, but it is small and has no specific functions for the Euro Area. The Euro crisis has revealed that this institutional set-up is not optimal. In June 2015, the so-called Five Presidents’ Report noted that “all mature Monetary Unions have put in place a common macroeconomic stabilisation function to better deal with shocks that cannot be managed at the national level alone” (p. 14). It proposed a “fiscal union” that would “improve the cushioning of large macroeconomic shocks and thereby make EMU over all more resilient” (p.14). 1. By the European Semester of economic policy coordination has been given clearer guidance for the Euro Area as a whole and a stronger focus on social aspects. 2. European Fiscal Boards and National Productivity Boards have been set up. 3. Technical assistance to Member States was boosted with the creation of the Structural Reform Support Service. 4. Important steps towards completing the Banking Union and Capital Markets Union have been taken, notably by advancing in parallel on risk-reduction and risk-sharing measures in the banking sector.